A thousand years in the future, mankind's influence expands into the universe. Alastair Reynolds epic vision of our journey into deep space will redefine Space Opera. Mankind is making its way out into the universe on massive generation ships. The new novel from Alastair Reynolds is one for fans of Peter F. Hamilton and Iain M. Banks. 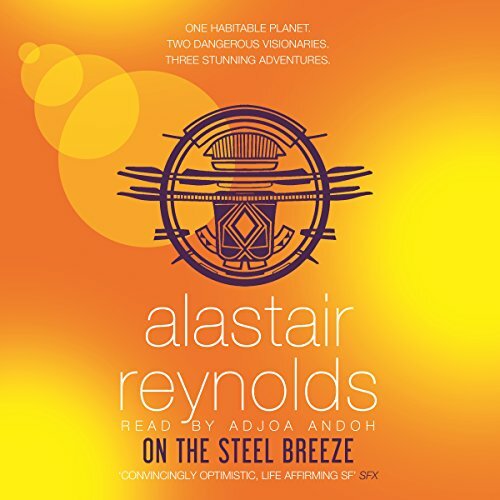 While I thought Blue Remembered Earth (the first of the Poseidon's Children series) only average, with On The Steel Breeze Reynolds returns to the levels of mastery I associate with many of his other books. Again, the scope is enormous, entailing the nature of politics, emotions, intergenerational ties, time, artificial intelligence, morality and God... And amazingly, he succeeeds in weaving these threads into a believable tightly knit whole. I am a fan of space opera, and so it should come as no surprise I find Reynolds so marvelous. Still, I think this book and the upcoming series deserves a much broader audience. There are some scenes in the book that should have particular interest for debates on morality and God, where the knowledge of being surveilled by powerful entities impacts (or not, depending on your interpretation) deeply moral decisions. Would love to hear them debated. The elephants are an interesting theme throughout the book, but I don't think Reynolds has used them as fully in the narrative as their repeated mentioning might make sensical. I suspect they will make their presence more known in future installments of the series. An earlier reviewer remarks that the books feels unfinished, perhaps as an outcome of the $1m contract Reynolds has with his publisher for the series. I am sure the book could be better (as could any book) and it might be it does not reach the full heights of some books in the Revelation Space series. Still, Reynolds manages to push all of the right buttons with me, which means I would not be able to give the book less than a full score. I cannot imagine Reynolds-fans will be disappointed. Adjoa Andoh does a really good job giving voice to the different characters and the tense emotions that sometimes grip them. Admittedly, I have always felt Reynolds books are better in audio than on paper, perhaps partly thanks to the narrators. The narrator tries to do character voices but fails miserably. Got halfway but had to stop. What did you love best about On the Steel Breeze? The gigantic scope of the story. Alastair Reynolds has a knack for such things and he proves himself again with this one. King of Space Opera he has been called and I don't disagree. What other book might you compare On the Steel Breeze to and why? I compare this book with mr Reynolds previous books of course but also with many books written by of Peter F Hamilton, who is also among my favourite writers. Yes. Adjoa Andoh does a great performance when telling this story. The african accents fits wonderfully with the characters in the story and when needed, she shifts to a more neutral accent. Very good interpretation of the personalities and it's quite easy to pinpoint who is talking even if you are distracted from listening for a minute. When Arachne talks however, is really hard to endure.... but maybe that is intentional. No. I always fall asleep when listening too long. Despite being quite good SF this could have been so much more. This book feels rushed, which I suspect comes from a demand for delivery. Sad if literature goes the same way as almost everything else. Maybe that could be a plot/trope in a future story? I feel that this book is like a sketch that Picasso made, many good things just hinted at. Quite a few great events are just summarised in the story, and a rather good amount of standard clichés are used when we are let into the experiences of the main characters. Mr Reynolds, I urge you: Lean back and write a real masterpiece. I can wait for it ten years or more! What disappointed you about On the Steel Breeze? I cannot finish this audio book. I find the narrator difficult to understand. Who would you have cast as narrator instead of Adjoa Andoh? Kobna Holdbrook Smith did a great job on the last one. This is a kindle book for me it seems. The story was interesting, with the twists typical of the author. The narration was excellent, with a wide variety of accents and voices. It's not the book.. I loved all previous books by the author. I just couldn't stand the narrator's interpretation. Giving district voices to the characters is great.. but she made caricatures of most of them. Pseudo African dialects, blubbering merefolk.. the list goes on and on. I feel like a book I might have liked, was ruined for me.